‪‪Is free higher education a human right? Join Jacana Media for a book discussion and intergenerational conversation at Constitution Hill. Catch The Cheeky Natives in conversation with the editors and contributors to the new book We Are No Longer at Ease: The Struggle for #FeesMustFall. Africa’s Lit chatted to some of the contributors to the new book We Are No Longer at Ease: The Struggle for #FeesMustFall. 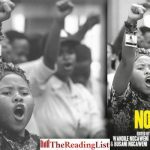 We Are No Longer at Ease is a collection of personal articles, essays, speeches and poetry mainly from voices of young people who were part of the student-led protest movement known as #FeesMustFall. Don’t miss Pan Macmillan authors at the Kingsmead Book Fair!